Open year round, dawn to dusk. Located in the heart of the Village of Naples, NY, Grimes Glen is the newest addition to Ontario County’s park system. Grimes Glen officially became a public park in 2008 as a result of a broad-based community effort. Through a combination of generous donations from individuals, businesses, and civic organizations, the Finger Lakes Land Trust purchased the thirty two acre property from then owner Donald Braun. 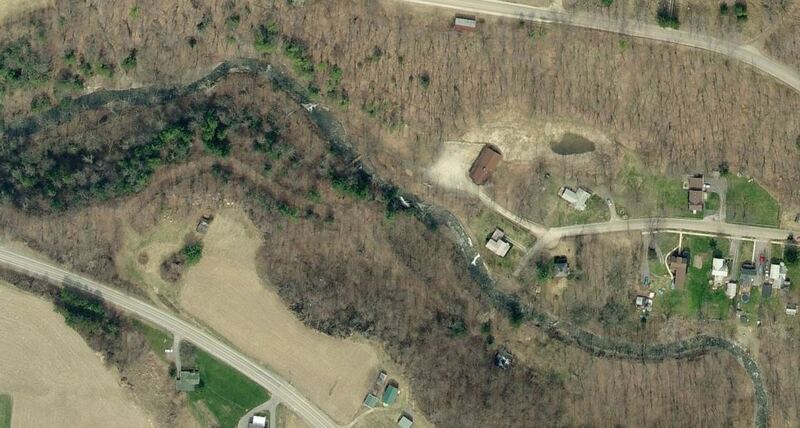 The property was then donated to Ontario County. The park had a long history of public access under Braun and the county began to manage the land as a public park in keeping with the history of public use. At the time of donation, extensive remediation was required to return the park to its once pristine environment. An informal, yet integral group of interested citizens known as FroGG (Friends of Grimes Glen: http://www.friendsofgrimesglen.org/) have provided cost-cutting, practical assistance to the county in maintaining the park. FroGG volunteers also serve an advisory role on necessary park matters and help sponsor public outreach events. The Glen is known for its waterfalls. However, it is best remembered as the source of the oldest fossilized tree in New York. The so-called Naples Devonian Tree was discovered in the glen by D. Dana Luther in 1882. A Naples native who served as President of the village, was a descendent of pioneers who first settled the town. Born in 1840, Dana Luther became interested in geology and spent many years assisting the research of his nephew, Dr. John M. Clarke, State Geologist and State Paleontologist for many years. Mr. Luther served on Clarke’s staff at the State Museum from 1891 to 1916. The fossilized three that Luther discovered in Grimes Glen was removed by paleontologists in 1887 and put on display in the State Museum in Albany. In 1982, the Naples Historical Society published a nine page pamphlet, “D. Dana Luther and the Naples Devonian Tree 1882-1982,” that is still available and relates the complete story of the fossil tree and Mr. Luther. Click here to view a photo album of Grimes Glen - Winter 2015! A trail winds along the creek to a point at which the terrain requires visitors to ford the stream to continue their journey. Many gladly do, and are rewarded with the wonders at the second falls, about one-half mile from the parking lot. Grimes Glen is a classic Finger Lakes gorge, a continuously changing and fragile environment shaped and reshaped over time by the power of water. Grimes Glen is uniquely accessible, within walking distance from the Village of Naples. County crews have erected a new pedestrian bridge in Grimes Glen Park located in the Town of Naples. The County reused salvaged highway bridge beams and cross members for the load bearing elements of the bridge to reduce costs for the new structure. Also, local artist Darryl Abraham created two mural artwork scenes to enhance the bridge’s appearance. 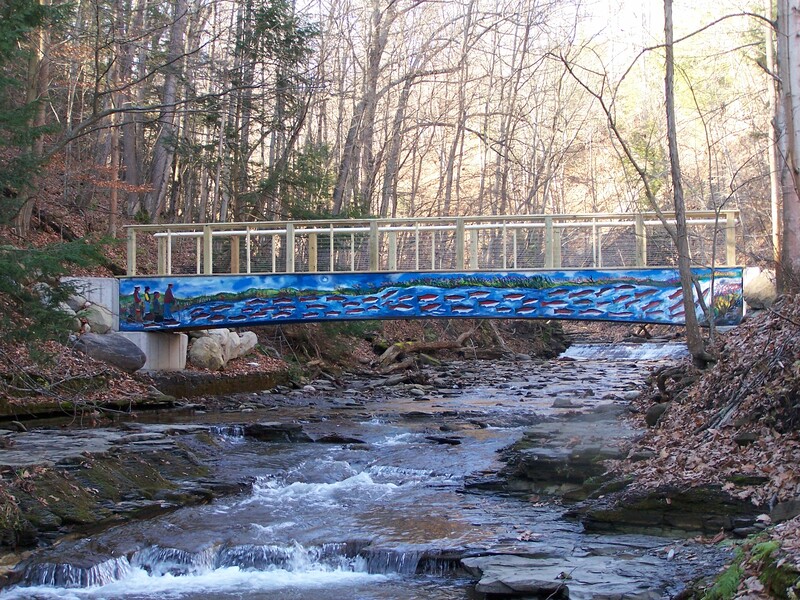 The panels comprising the artwork are built from metal and powder coated in colors consistent with a water and hiking theme. County crews attached the panels to both sides of the structure to cover the large steel members supporting the bridge. In addition, a cable hand railing system on the bridge will help to not impair views of the glen. Grimes Glen Digital Trail Extension: A chance to Experience Grimes Glen in All Seasons! Seasons in the Glen is a virtual park experience. The videography of David O. Brown provides all people an opportunity to enjoy the natural sights and sounds of Grimes Glen, a quintessential Finger Lakes gorge and Ontario County park in Naples, NY. Funding for this project was provided by the Federal Highway Administration’s Recreational Trails Program. Please click the link below to view a YouTube video gallery of this unique park perspective.